A Landscaping Tip – Mistletoe Not Good For Your Trees…! target=”_blank”> In case you didn’t know… Mistletoe is a Parasite. We work for a partnership that is fixing up a home at 9051 Posada Way in Sacramento. As part of our service, since they are out of the area, we go by during the week while the work is being done and Video the progress. 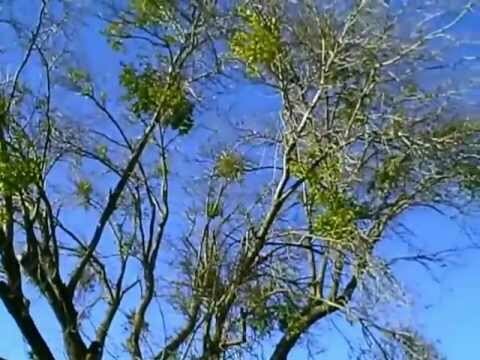 A couple of days ago I was out there and happen to notice that trees belonging to the neighbors on both sides were infected with Mistletoe. To see what it looks like take notice of the pictures above here. Click on the picture to see a short video. These trees are going to whither and die because of this infestation if they are not removed soon. You might not notice them during the summer time because the host tree will have leaves that might hide or mask their presence. However during the winter, they don’t die and are easy to spot. If you see this condition on your property or a neighbors property let them know. Ridding the tree of this pest will really make a difference in restoring the health of a tree, even if it’s near death. All you have to do is cut the branch(s) where the mistletoe is to save the tree. If you need a landscape company or tree service to do this for you, contact us and we’ll give you a couple of references.